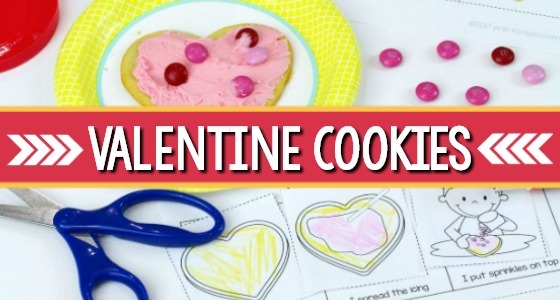 Valentine’s Day is a popular holiday that is often celebrated in preschool and kindergarten with a focus on friendship and greeting card exchanges. 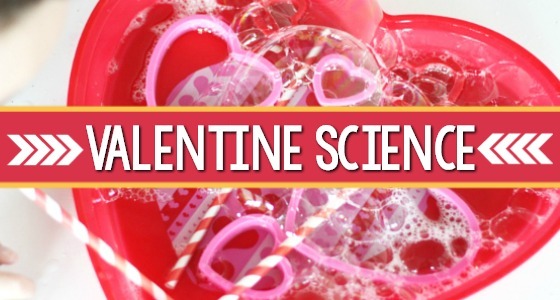 Valentine’s Day doesn’t have to be all about romantic stuff, there are plenty of ways to provide educational activities that easily tie into this popular holiday. 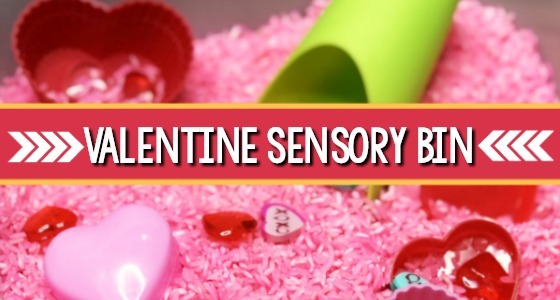 Here are some fine motor activities for preschoolers with a fun Valentine’s Day twist! 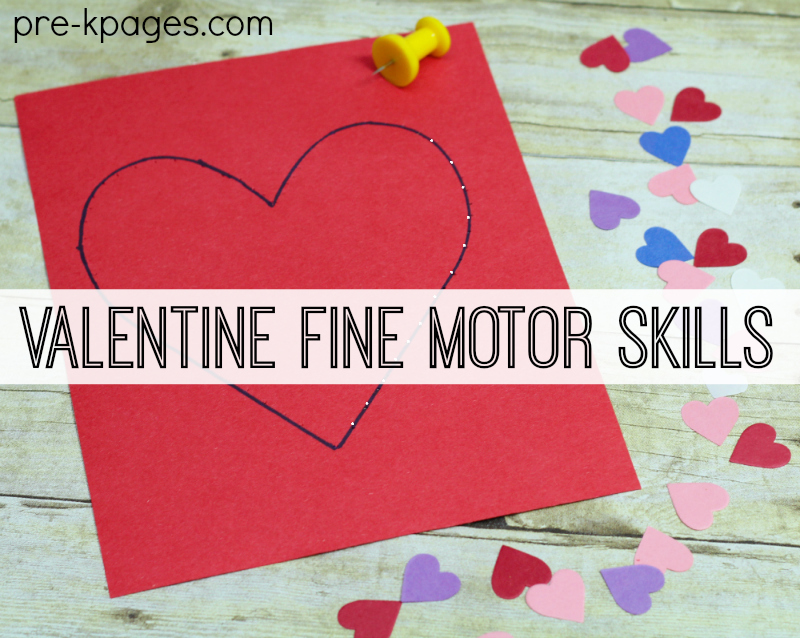 What Are Some Fine Motor Skills For Preschoolers? Children need to develop fine motor skills, or the small muscles in the hands that are used for holding writing tools like pencils and crayons. 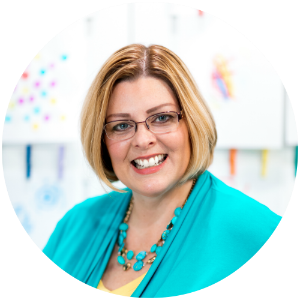 Without well-developed fine motor control children may struggle with writing when it is time to write their names or begin formal writing of words and sentences. We also know that young children learn best through play and the use of hands-on materials. The learning activities included below are all very playful and fun. They will hold the attention of young children for longer periods of time while strengthening their fine motor skills at the same time. Do your kids love to use glue? Learning to squeeze just the right amount of glue can be quite a challenge for some young children,. But it is an important exercise that will help them recognize the pressure needed for not only squeezing glue, but holding a pencil. First, trace a heart shape on the construction paper. 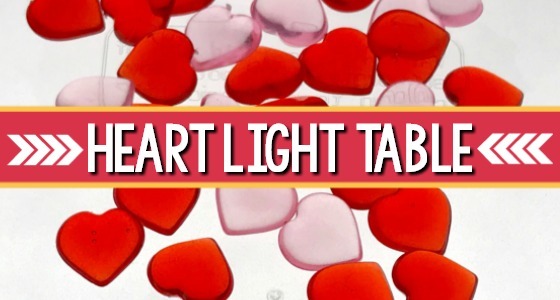 Next, invite students to squeeze small dots of glue around the heart outline. Some children will squeeze too hard and create giant blobs instead of dots, others may squeeze too lightly and their dots may hardly be visible- but it’s all good! The important thing is that they are exercising the muscles in their hands and practicing how to grip and squeeze the glue to achieve the desired pressure. This is a super simple and fun activity your kids are sure to love! First, demonstrate how the paper punch works. Then, place the punch and paper of various colors in a designated area such as your writing center or art center. 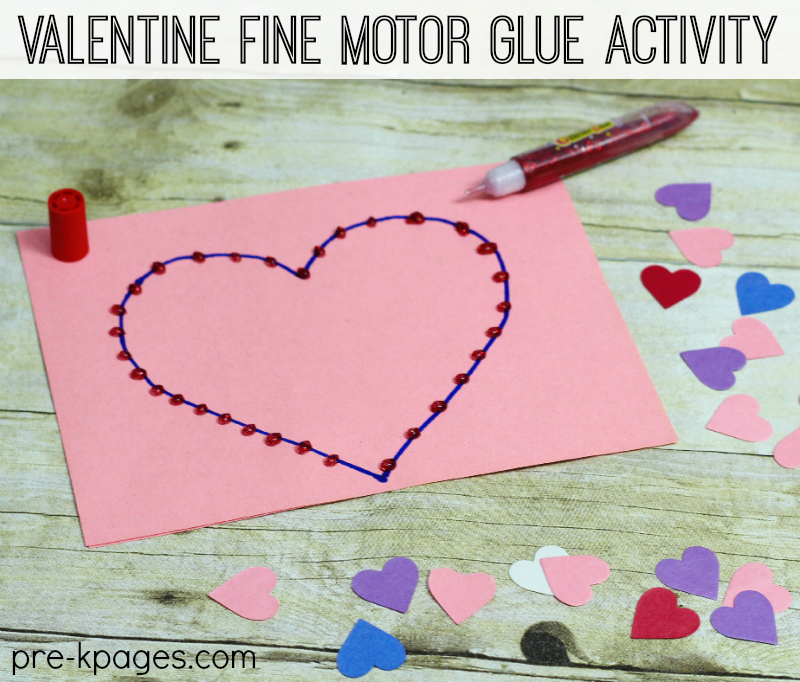 Add some glue and copy paper to this area and invite the children to glue the hearts to the paper for extra fine motor practice. Before the “dangerous” police come out in full force, you should know that this activity is a fine motor powerhouse! 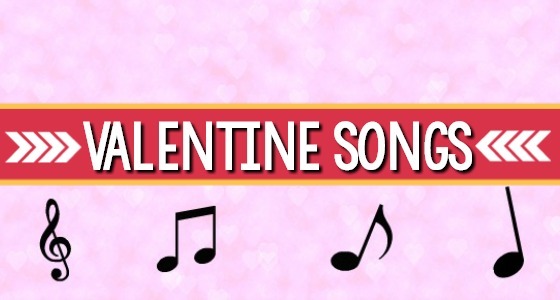 First, trace an outline of a heart on construction paper. Next, invite children to use the push pin to punch holes around the outline. Place the papers on a soft surface that won’t be harmed such as a thin carpet, craft foam, or a cork board. When kids grip the jumbo push pin they use a tripod, or three finger grasp, which is the grasp used to hold a pencil appropriately. The concentration required to poke the pin through the outline over and over is also great for stretching little attention spans! If your kids still put things in their mouths or can’t be trusted to use the pin as intended then don’t choose to do this activity. We’ve discussed the cutting sequence before. 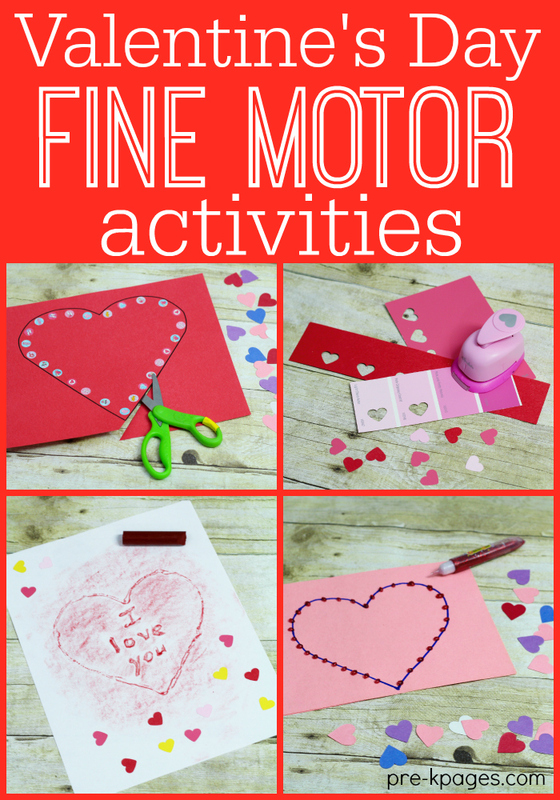 If your kids are ready to cut curved lines then this is a great fine motor activity to develop their fine motor control that kids will absolutely love! 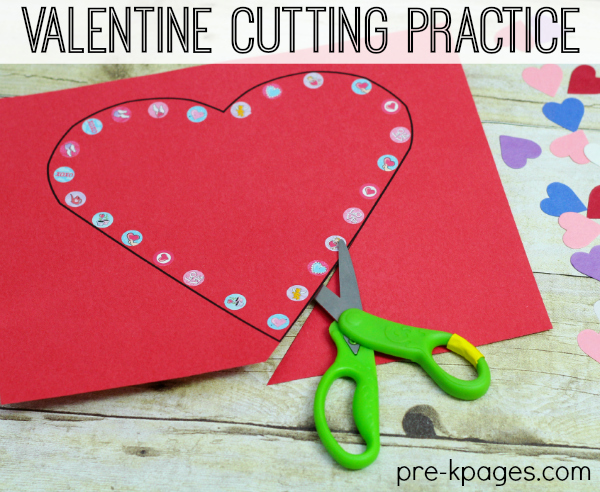 Start by tracing a heart shape on construction paper. 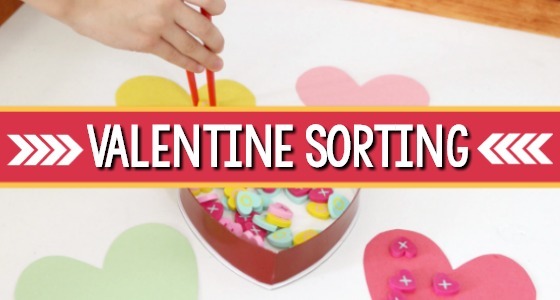 Next, invite children to place small Valentine stickers around the inside of the heart shape. Then, they can use the scissors to cut around the outline. 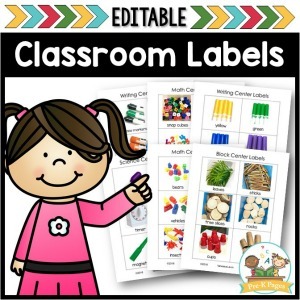 The stickers will help them focus on the areas to cut as well as mark their progress visually. I saved the best for last! This activity is always a huge hit with all young children and it’s also perfect for fine motor development. Start by tracing the shape of a heart on a piece of cardstock. Then, write “I love you” in the middle of the heart. Next, trace over the heart and words with liquid glue or a glue gun and let dry overnight. 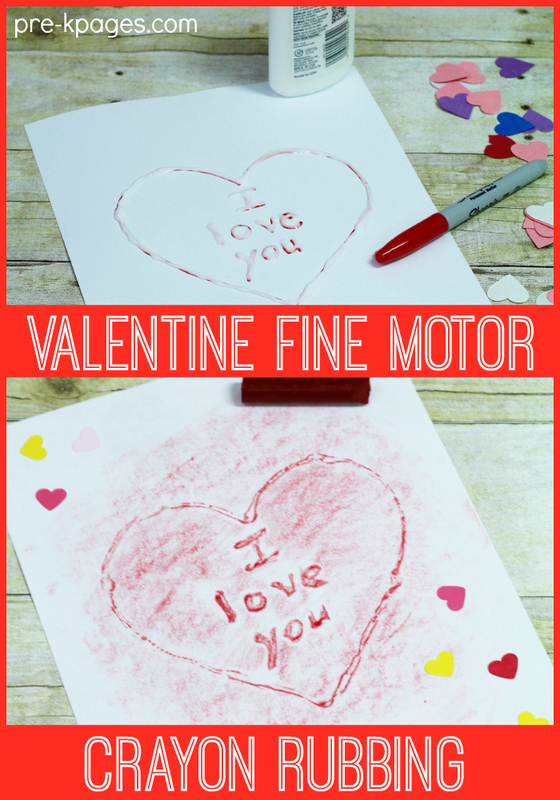 When the heart template is dry, invite the children to lay a piece of white copy paper over the template and rub the long side of the crayon over the copy paper to create a rubbing. Grasping the flat crayon can only be done using the tripod grasp, perfect for fine motor practice! 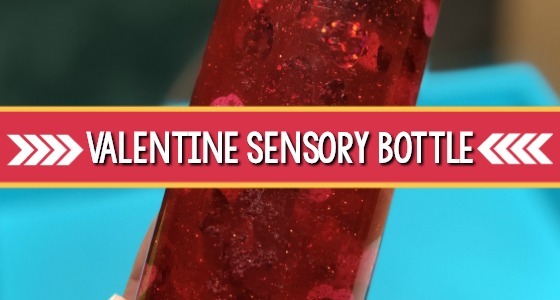 Of course Valentine’s Day is just one holiday where you can incorporate fine motor activities into your classroom with your preschoolers. 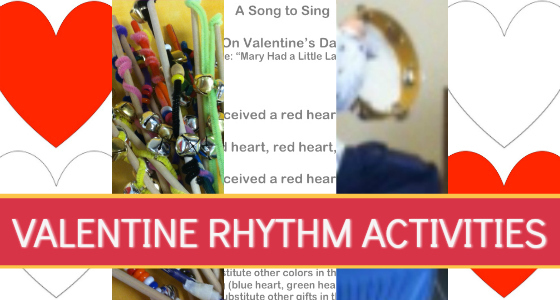 You might try a St. Patrick’s Day fine motor activity or a Halloween fine motor activity. When it’s Easter, these Easter fine motor activities will be perfect for that fine motor practice. 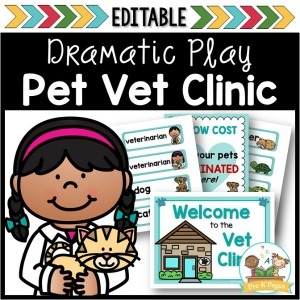 Using seasonal hole punches, colorful pipe cleaners your students can explore the materials independently. 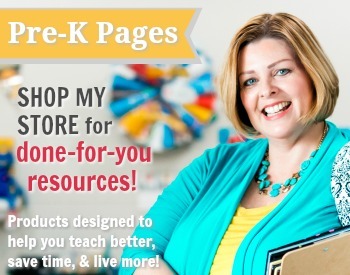 And most materials can be found at the dollar store. 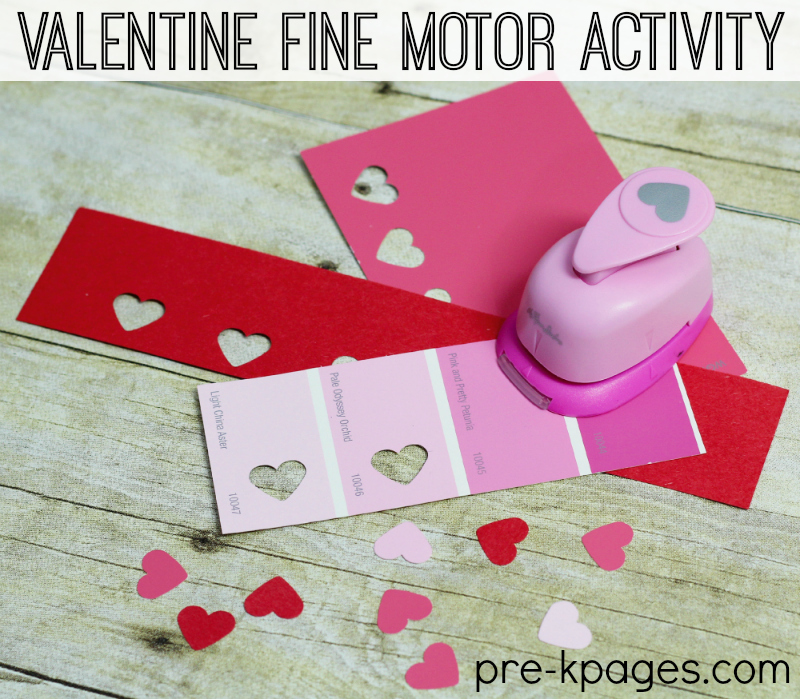 Around the same time of year, this Spring fine motor activity is something your preschoolers will enjoy. 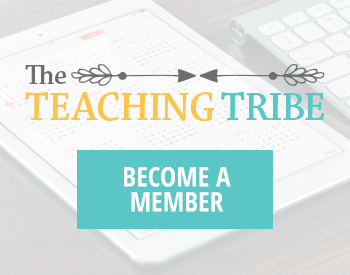 Have your students try cutting paper straws and threading them through a pipe cleaner. No matter the holiday or time of year, a fine motor activity will always be enjoyed!